It was one of the biggest TV hits of the 1970s, both with British audiences and around the world. 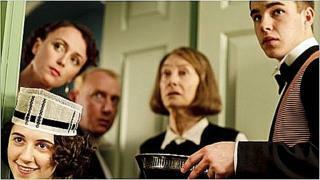 ITV's Upstairs Downstairs also won award after award, including Emmys, BAFTAs and a Golden Globe. Now, after an absence of 35 years, the period drama has been remade by the BBC - with actress Jean Marsh reprising her role from the original show. The ITV series showed life above and below stairs at a wealthy home in Edwardian London, complete with gossip, intrigue and affairs of the heart. Marsh played housemaid Rose and also co-created the series. At first, she says, she had reservations about both her character's and the programme's return. "I think my main feeling about coming back to it was fear and trepidation, and would we let the original one down," she says. "Now I think it's going to satisfy old fans and new fans. It's got a lot of zip in it [but] it is faithful to the past." When Marsh and Dame Eileen Atkins, who also appears in the new series, devised the drama 40 years ago, they had specific aims. "We were feeling quite political about it," says Marsh. "We both had little chips on our shoulders. "We felt that first of all there wasn't enough work for women. And also that servants and working class people were usually treated as jokes." In the new version the same themes continue. Yet outside events also intrude on the characters' lives. "Life is getting hard for everybody," explains Marsh. "And we're clearly building up to the big Second World War." The original series spanned events between 1903 and 1930 and featured many of British acting's most famous names. Gordon Jackson played Hudson the butler, John Alderton appeared as the family's chauffeur Thomas, while Pauline Collins played Sarah the maid. The new show picks up the action in 1936 with another family moving into the Bellamy family's old house at 165 Eaton Place. The cast is again full of familiar faces though - not least Art Malik, no stranger to classic drama after his role in 1984's The Jewel In The Crown. The actor, who plays Dame Eileen's secretary Mr Amanjit, says he was a big fan of Upstairs Downstairs when it was first broadcast. "I grew up watching this," he says. "It just had a lovely moral centre. "It was a family piece, you could just watch it. Just great drama, great writing, great stories and great acting." Some may object to bringing back a series that occupies such a special place in people's memories. But Malik believes it was the right decision. "I don't see a problem in revisiting things," he says. "No one ever questions if you want to do Hamlet again." Keeley Hawes, who plays Lady Agnes Holland, agrees. "I'm a little bit too young to remember the original but I have seen a little bit of it," she says. "It's incredible. [The new series] comes with this amazing history, but actually it feels like something very new. "They're all completely new characters, apart from Jean who's coming back as Rose. So it feels very fresh and like a completely different thing." Ed Stoppard, who plays her husband Sir Hallam Holland, says he's also too young to remember the original but is well aware of its exalted status. "There's a certain amount of pressure," he confesses. "And one is aware of it being a kind of iconic brand, almost. "But then obviously at the same time, you feel very privileged and flattered to be a part of it." Stoppard - son of playwright Sir Tom - believes younger viewers as well as older ones will be able to relate to the historical events that surround the series. "Because the Second World War is such an enormous crucial event, I think younger generations today feel a great affinity with that middle section of the 20th Century," he says. "[When] a character mentions Oswald Mosley or people talk about Hitler, even generations younger than mine have at least an inkling of what someone's talking about. "Or at least what the ramifications would be. There's a certain relevance, a certain resonance." As for Jean Marsh, she says for her the return of the series is both an exciting and an anxious time. "When it actually goes out I'm going to feel absolutely terrified," she says. "There is a lot of pressure. You feel such a sense of responsibility." Upstairs Downstairs is on BBC One at 2100 GMT on 26, 27 and 28 December.